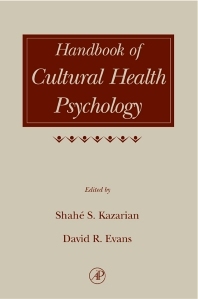 The Handbook of Cultural Health Psychology discusses the influence of cultural beliefs, norms and values on illness, health and health care. The major health problems that are confronting the global village are discussed from a cultural perspective. These include heart disease, cancer, HIV/AIDS, pain, and suicide. The cultural beliefs and practices of several cultural groups and the unique health issues confronting them are also presented. The cultural groups discussed include Latinos, Aboriginal peoples, people of African heritage, and South Asians. The handbook contributes to increased personal awareness of the role of culture in health and illness behavior, and to the delivery of culturally relevant health care services. Part I: Health Psychology for a Cultural Perspective: Theoretical Considerations. S.S. Kazarian and D.R. Evans, Health Psychology and Culture: Embracing the 21st Century. M.S. Mulatu and J.W. Berry, Health Care Practice in a Multicultural Context: Western and Non-Western Assumption. T.L. Armstrong and L.C. Swartzman, Cross-Cultural Differences in Illness Models and Expectations for the Health Care Provider-Client/Patient Interaction. D.R. Evans and S.S. Kazarian, Health Promotion, Disease Prevention, and Quality of Life. H.M. Shearer and D.R. Evans, Adherence to Health Care. Part II: Health Psychology and Culture: Specific Health Concerns. B. Baker, A. Richter, and S.S. Anand, From the Heartland: Culture, Psychological Factors, and Coronary Heart Disease. C.C. Gotay, M. Muraoka, and J. Holup, Cultural Aspects of Cancer Prevention and Control. A. Raj, H. Amaro, and E. Reed, Culturally Tailoring HIV/AIDS Prevention Programs: Why, When, and How. C.T. Korol and K.D. Craig, Pain from the Perspectives of Health Psychology and Culture. S.S. Kazarian and E. Persad, Cultural Issues in Suicidal Behavior. Part III: Health Psychology: Issues with Specific Cultural Groups. H. Betancourt and J.L. Fuentes, Culture and Latino Issues in Health Psychology. S.S. Kazarian, Health Issues in North American People of African Heritage. G.S. Renfrey and R.R. Dionne, Health Psychology and the Native North American Client. X. Chen and L.C. Swartzman, Health Beliefs and Experiences in Asian Cultures. P. Chandarana and J.R. Pellizzari, Health Psychology: South Asian Perspectives. E.A. Wise, S.K. Carmichael, C.D. Belair, C.B. Jordan, and N.E. Berlant, Women's Health: A Cultural Perspective. Dr. Shahe S. Kazarian is a Professor in the Department of Psychiatry, and an Adjunct Professor in the Department of Psychology at the University of Western Ontario. He is the author of numerous books, chapters, journal articles and tests in the health field. He is the coeditor with David R. Evans of Cultural Clinical Psychology published by Oxford University Press. He is the author of Diversity Issues in Policing, which is now in its Second Edition and was written for the Police Foundations Program. His research interests involve the study of diversity and health, and diversity approaches to service delivery. For many years he was a Department Head and more recently a Manager of two clinical speciality programs at a major psychiatric facility in Ontario, Canada. Dr. David R. Evans is a Professor in the Department of Psychology at the University of Western Ontario and is a practicing psychologist in Ontario. He is a past President of the Canadian Psychological Association, and the Ontario Psychological Association. He is the author of numerous books, chapters, journal articles and tests. His most recent books include The Law, Standards of Practice, and Ethics in the Practice of Psychology published by Emond Montgomery; Essential Interviewing (5th Edn.) with Maragret Hearn, Max Uhlemann and Alen Ivey published by Brooks/Cole, and with Shahe S. Kazarian he is the coeditor of Cultural Clinical Psychology published by Oxford University Press. He is also the author with Robert Butcher of Ethical Reasoning in Policing, which was written for the Police Foundations Program. His research interests include factors that affect Quality of Life and health promotion.He is a consultant with a number of police services in Ontario, Canada.